Hi there! The other day, I saw someone post a question on Athena’s Facebook page associated with her Holiday Hustle Challenge and I got so excited when I went to answer it. Her question was based around the fact that she had never been to a group exercise class and was thinking of trying one out, but she was a little nervous and wanted some tips to make her feel a little more comfortable. First off, I get SO EXCITED to welcome new people to my classes and the general world of group exercise. Total dork status, I know. Secondly, I realized that if she was feeling this way, there are probably others out there that are feeling the same way. Today, I’m going to share some tips/pointers/things to expect so that if you’re on the fence about going to a group exercise class, hopefully you’ll feel ready to take the plunge after you read this! 1. Check out the schedule ahead of time so you can read about the various classes and whether or not you need to sign up. 2. Pick out a comfortable outfit that you feel good in because when you feel good about yourself, things are just better, amiright? When I feel comfortable in my outfit, I tend to be more confident, which helps in a new setting. 3. That said, make sure what you wear is appropriate for the class. While a sports bra and flashy, baggy pants may be perfect for Zumba, you’ll probably get some head turns if you wear that to a spin class (not to mention it would be dangerous to wear anything baggy to spin!). I’d say play it safe- comfortable pair of crops that don’t ride down or annoy you and a tank or form fitting t-shirt. I tend to say stay away from super baggy clothes because it’s hard for instructors to check your form and to make sure you’re doing things correctly. Tip: don’t wear shorts to spin and try to avoid booty/loose shorts in ALL classes. No one wants to see your bum! 4. Arrive early. This is especially important because you want to make sure you have time to get everything set up without rushing and feeling late. It also gives you time to familiarize yourself with the room and other members joining the class. 5. Introduce yourself to the instructor so he/she knows that you’re new. You can also let them know your current fitness level and if you have any injuries. It’s important to let instructors know you’re new to their class (or group exercise classes in general), so that they can be sure to check out your form and provide proper explanations and modifications (if needed). 6. Don’t set up in the back corner. You don’t need to be front and center, but be in a place where you can see yourself in the mirrors (to check form!) and so that the instructor can see you and doesn’t forget about you. 7. Get a selection of weights, making sure you have some lighter ones if you haven’t been actively lifting so that you can avoid either struggling with heavy weights or trying to sneak around people to get lighter ones. Play it safe and get a variety. 8. Mind your body and pay attention to how YOU feel, not how everyone else around you appears to feel. They’ve likely been going to these classes for a while, so trying to keep up with them might end up discouraging you or sending you home with an injury. Take breaks when YOU need them, even if the class as a whole isn’t resting. Remember- everyone was new to the particular class you’re trying at some point, so focus on yourself and not everyone else. 9. Even if things feel great, try not to get TOO carried away because the moves and exercises you’re doing may be entirely new to you, which could leave you VERY sore the next day. There’s nothing worse than being all amped up about trying a new class, giving it your all (and then some) and waking up the next day unable to move. 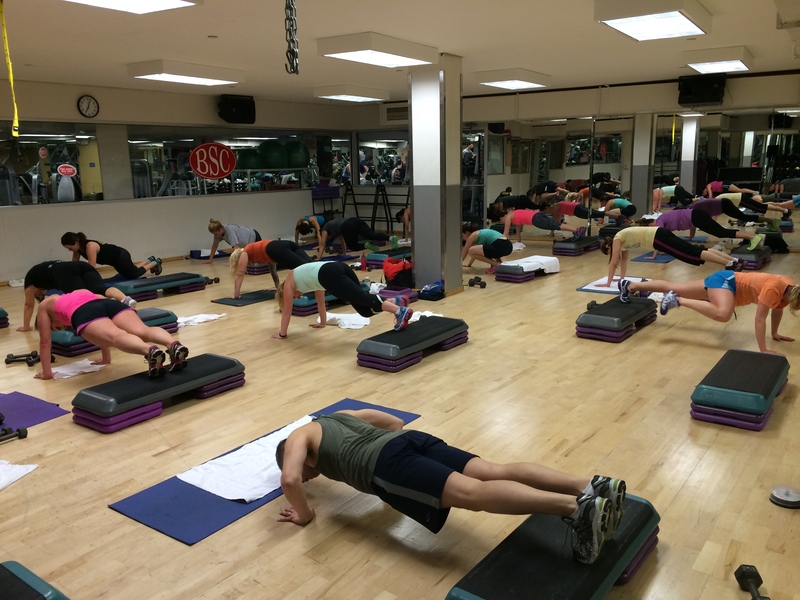 So, are you ready to try a new class or to make your way into the group exercise setting now?! Questions for you: What was the first class you went to? What are your tips for making people feel comfortable going to their first class? I’m sure I missed some good tips, so I’d love to see what you would offer up for advice! One of the first group classes I went to was yoga and I learned that child pose cuts off circulation to my legs. I still did it for as long as they said and didn’t tell the instructor that my legs were numb. Had I heeded these tips I would have left much happier! Great post! I think you gave great tips. I also think that people who regularly attend classes should try to welcome new people and make them feel comfortable. It can make a big difference!